How Much Work Could a Work Chuck Work? What do you say to whom, and how much, and when…? People usually don’t address their six year old sister with “Your Honor…” and they rarely say “Sup?” to their principal. We don’t speak the same way to everyone. We make changes to what we say based on our audience – who we’re with, and what’s going on. Let’s look at a couple decisions we make about changing our language for different audiences – WHAT, and HOW MUCH – by thinking about balance. Do you discuss details of upcoming dentist appointments with your friends? Not usually – that’s something that’s typically discussed with your parents. Do you say, “Good afternoon” to classmates? Probably not that much – that’s something reserved for someone like a teacher. So what topics do we raise, and what words make sense to use, based on whom we’re with? 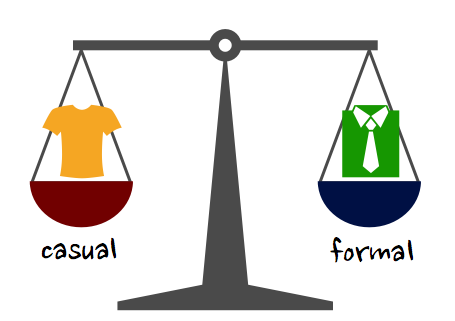 A helpful way to think about this difference is through balancing casual and formal language. Casual and formal language can be hard to define explicitly. In general, casual language is words and topics that we say naturally, the first things that come to mind. Formal language describes words topics that we think about and consider, and possibly censor, for a particular type of person. For example, if you were late to school one day, you might tell your friend: Damn. My stupid alarm didn’t go off. But for your science teacher, that doesn’t match how she’s expecting to be spoken to – for her, it would be more like: I’m sorry, won’t happen again. What is my connection to the person I’m speaking to? If I’m with someone of “higher status” than myself, I should probably lean more toward formal language. This might be a teacher, professor, principal, boss, or a relative I don’t know very well. If I’m with a friend or someone younger than I am, I can usually lean more toward casual language. There’s a whole other aspect of considering our audience: after we’ve figured out what to say, we have to consider how much to share. When talking about my favorite TV show to my friends who also watch that TV show, I can get into an incredible level of detail about all the evidence I have for my theory that a certain character didn’t really die… If I try to explain that much to my mom – who hates the show – she’ll be totally disinterested and confused. She won’t know the characters or the plot points, and she’ll probably not care! This speaks to the need to balance how much we explain and how much we skim. How much does my audience know about this topic? How interested is my audience in the topic? Of course, it’s sometimes challenging to figure out how much someone knows, and how interested someone is. But it helps to have it be “on our radar,” something we think about and consider. For example, on our explain ~ skim balance, when thinking about talking to dad’s friend about pi day (March 14, or 3/14, so named for the number pi which begins 3.14), it probably makes sense to be somewhere around 80/20 skim. He may or may not know or be interested, but it couldn’t hurt to mention. …but in after school science club, it might be good to be more like 60/40 explain about pi day – to talk about it, and in some detail, but not so much detail that it takes the whole club time. Why bother think about audience? In the U.S., people sometimes refer to our right to free speech to mean we can say whatever we want to whomever we want. In reality, there are often negative outcomes to making mistakes about what we say to whom. Talking about a topic to your boss that he finds inappropriate (too casual) could lead to getting fired. Talking in too much detail about something that a classmate isn’t interested in (too much explain) may mean they avoid working with me in the future. The Balance Challenge is all about the thinking we can do in social situations to help us create the best outcomes for us and the people we’re with. Balancing casual and formal language, and explaining and skimming, can help to do just that. And as always, remember this advice is not just for folks with ASD, but for neurotypicals as well. Anyone who knows me (or reads this blog…) knows that I myself can always benefit from trying to lean more toward skim! For an explanation of the Balance Challenge framework, see Balance Breakdown, always accessible on the top navigation bar. Take it easy, or take it seriously? Teachers—Do we let em fail? Let it go, or no no no! Teachers—How do we be both firm and flexible?